Looking ahead to our next show, we will obviously bring back the amazing Eleni Mettyear and her photobooth, which is creating it’s own reputation amongst the crowds, so make sure you look gorgeous. The legendary Recommender Mixtape, (4th edition), will be ready and handed out in gift packs, alongside our badges (seeing them on lapels all around town now!) and stickers, amongst other items. See the mixtape mp3 listed below that was handed out at our last party. Lastly we will be providing some amazing music to help make our first Saturday night go with bang, no, make that a BOOM! THE HIGH WIRE – First up on tonight’s showcase will be this London trio who make utterly astonishing, angelic pop music. Having released their debut album, The Sleep Tape, earlier this very month, we know that we can expect a set packed with extraordinary songs. Come see them live and we promise you will get as convinced as we are that this is a very special band. FOREIGN OFFICE – Feel the evening change gear as this quad of fantastic songsmiths arrive to play the last gig prior to the launch of their single, Leaving The House (29th March). It’s as strong as any indie track we’ve heard in recent times and the buzz is building up. They’ve recently supported other Recommender favourites, such as Wave Machines, O.Children and our headliners for April, Wild Palms. Watch it hit fever pitch as these upbeat melody makers storm our party. 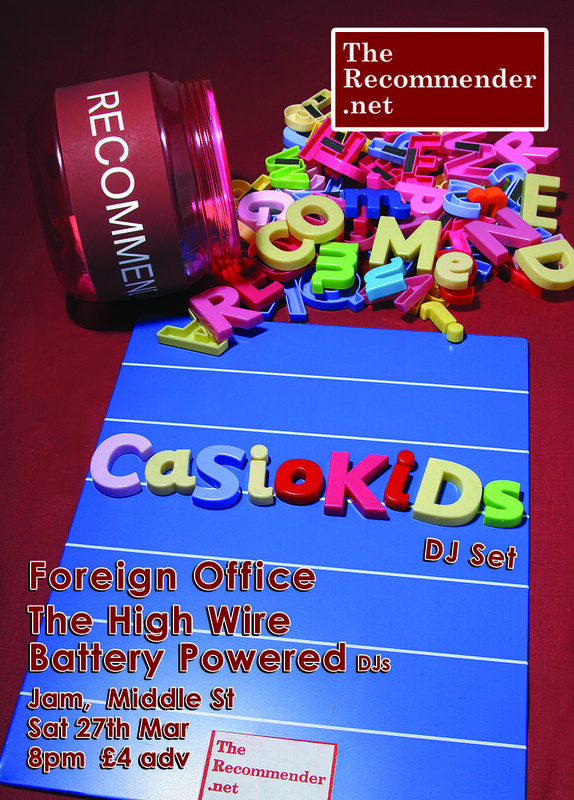 CASIOKIDS (DJ SET) – If you know about the Casiokids then you know how expert they are at whipping the crowd into a frenzy, so we expect no less from their DJ sets. However, if you don’t know the Casiokids (!?) then prepare yourself to witness the dancefloor taking off. They return from their recent supporting tour of Hot Chip and a successful SXSW Festival in the USA. There really couldn’t be a better way to enjoy a Saturday night. We think it’s fair to say that the famous NME Radar Tour that rolls around the UK each year can often be hit (La Roux, Friendly Fires) or indeed miss (The Chapman Family, Towers Of London). We were surprised and most pleased to hear the news, announced a few weeks back, that this September/October’s showcase will be bringing us several of The Recommender’s favourites. It’s very much something to look forward to and only strengthens the belief that The Recommender blog has it’s finger on the jugular of the new music scene, having blogged several of these artists months ago. Nice. The highlight will of course be the majestic Marina & The Diamonds with her showmanship, but Yes Giantess will also be well worth catching. Headliners and sweet melody-makers, Golden Silvers, are more established with their debut album, True Romance, having already been released. The unknown live act will be SXSW hits, Local Natives, which we blogged about back here. We think that this is the strongest ever Radar Tour line up from the regular NME shows. We hope you agree. We suggest that you grab those tickets whilst you can…see you down the front. This edition of The Gig List showcases a couple of great nights out for you at venues neatly placed on our beloved Brighton seafront. Both are part of a couple of tours, one from Radio One DJ, Annie Mac, and the other from Vice Magazine. 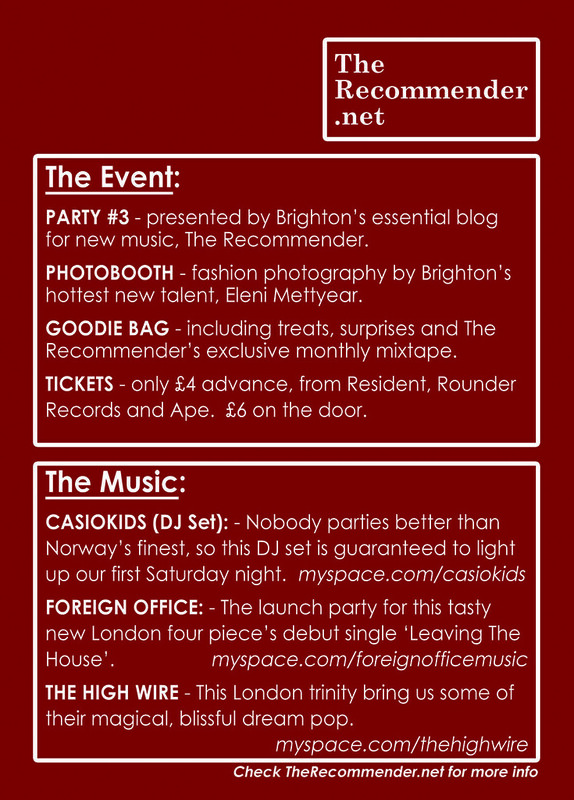 November’s lined up to be a an expensive month if you like your new music and you live in Brighton. Why else do you work so damn hard though right!? This DJ is about as surrounded in mystery as the devil himself. Very little is known about him. His name and photo are nowhere to be found, so speculation is rife. I better be careful what I write here, and apologies if I get things wrong, but it’s not the easiest task getting details on this. If you believe NME, then you’ll be forgiven for thinking this guy is one half of Soulwax. Other sources say he’s one half of The Black Ghosts, a band of which he’s done an awesome remix (my favourite tune by him to date), as well as remixes for Crookers and his well known popular club tune packed full of rave flavour – Mars. He’s linked all the time with Boy 8-Bit, Herve and that whole warped, bass-heavy, fidget-house dance scene. “The greatest trick the devil ever pulled was convincing the world he didn’t exist“. Well he does exist and he’s DJ’ing at Digital, so go see for yourself…. OK I gotta keep this relatively short and sweet because Little Boots is lined up for a Q&A on here soon with a little luck and she’s also getting her own Recommender posting too, so I don’t want the blog turning into too much of a Little Boots love-fest. However, she is totally adorable and a refreshingly brilliant musician. She’s blowing up in the media just about everywhere currently with her awesome synth-pop. As the former frontwoman for the band Dead Disco she should be used to live performances, yet she’s as fresh-faced and wide-eyed as her gathering crowds of teenage worshipers. She’s coming to our town for what will be one of three gigs in the last few months of 2008 in Brighton with the Vice Magazine tour, ‘Vice Kills’, at Coalition on the beach front. She will perform on the same bill as DJ Nightmoves and rapper DELS. All will be well worth your investigative time.